August 16th 2018 - The garden is defeated! Another milestone in the fight against domestic staff has been completed - it'll be moving menacingly around a garden near you soon. It's called The Edwin Budding Auto-Gardener - it is designed to mow your grass and trim your hedges without human intervention (other than to fill it with water and rocket fuel....). Full details can be found here. Nigel Williams is honoured to have been invited to take part in an exhibition of sculpture held as part of their 'Crafts Alive' event by the Gloucestershire Guild of Craftsmen at Rodmarton Manor, that pinnacle of Cotswolds Arts & Crafts architecture and craftsmanship. For more details see the exhibitions page. The giant copper pineapple, a commission for Nigel Williams from a private client (and many months in the making! ), has been completed, and permanently installed in woodland on the clients premises. For more details, click here. Nigel Williams is taking part in the Oxford Sculptors Group exhibition at Kiftsgate Court Gardens in Glucestershire, UK from the 19th August to 6th September 2017. For more details see the exhibitions page. Steam-age sculpture will be displayed in a "Steam Cathedral"! Nigel Williams has been invited to put on an exhibition at Kempton Steam Museum in London, UK in September 2017. The museum is the home of the world's largest working triple-expansion steam engine - awesome! Can't think of a more suitable venue for this sculpture! For more details see the exhibitions page. Nigel Williams has been invited to put on an exhibition of his "K-scopes" project within the Nuffield Orthopaedic Centre Hospital in Oxford, UK during Nov/Dec 2016, and into Jan 2017. Twenty-five large 40" x 30" prints will be spread around the walls of this modern hospital. For more details see the exhibitions page. National Trust Avebury has invited Nigel Williams to take part in their new Art Exhibition, arranged in the beautiful garden of Avebury Manor, by the famous stone circle in Wiltshire. The exhibition runs from August 27th until September 25th 2016. For more details see the exhibitions page. Sculpture Heaven, near Cardigan in West Wales, have agreed to display 'Yoruba transition' by Nigel Williams in their delightful sculpture garden (run by angels!). The exhibition will be open from Easter until the end of August 2018. For more details see the exhibitions page. What could be a better place to retail the remarkable Victorian and Edwardian appliances created by Nigel Williams than in an emporium created within a Victorian Railway Goods Shed? The enterprising folks running the Tetbury Rail Lands Regeneration Trust have invited Nigel Williams to take part in a Sculpture Exhibition housed in the Goods Shed at the former railway station at Tetbury in Gloucestershire. It runs from the 1st to the 21st of October 2015, and more details can be found on the exhibitions page. The latest domestic contrivance created by Nigel Williams is designed to reduce your servant count, and therefore make more of your income available for leisure activities. It's called the "ScaraBooth" Remarkable House-cleaning Automaton, and it is guaranteed to wizz round cleaning your house completely automatically, setting fire to your carpet no more than once. Full details can be found here. National Trust Chedworth Roman Villa has invited Nigel Williams to take part in their new Art Exhibition, near Cheltenham in Gloucestershire. The exhibition runs from September 12th until October 4th 2015. For more details see the exhibitions page. A large new sculpture has emerged, as if by magic (or lots of hard work): another African-style mask work, named after an African tribe who have been known for making art using brass: "Yoruba transition". The name and some details of its construction hint at the massive changes which have taken place in Africa during the last few generations. Images and more details here. The piece is currently on display at Sculpture on the Farm at Stewkley. Nigel Williams has been invited by The Elemental Sculpture Park, near Cirencester in Wiltshire, to exhibit some of his work in their site. The exhibition opens on Summer Solstice June 21st 2015, running at least until the end of September 2015. 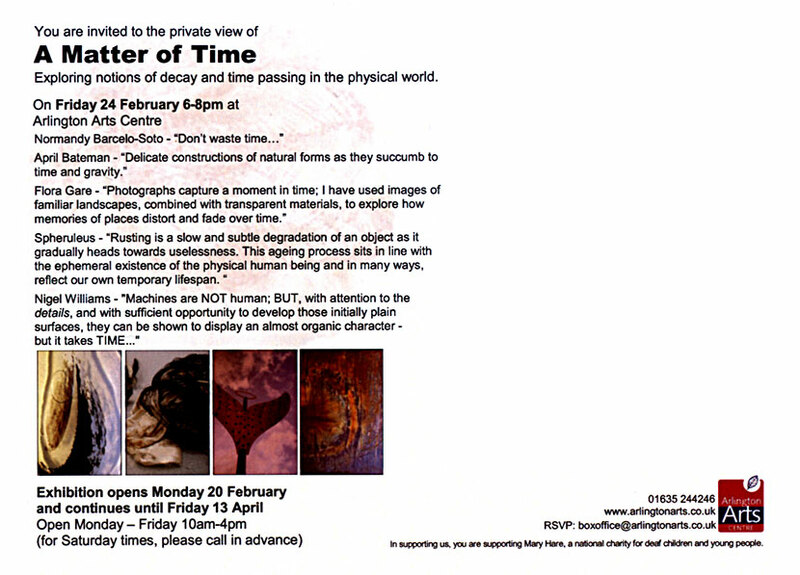 For more details see the exhibitions page or the Elemental Sculpture Park website. Nigel Williams has been invited by Ace Space (Newbury) to create a large exhibition of his "K-scopes" project. Twenty-three giant 30" x 40" (76cm x 101cm) prints from the project will fill the hall at Ace Space. The exhibition opens on Wed 25th February 2015, running until early 2016. Access is possible during any events at Ace Space (see their website), and at other times by appointment (contact us). More details of the "K-scopes" book published by Nigel Williams, containing all the images in the exhibition, can be found here. Modern Art Oxford have invited Nigel Williams to offer a metal-working sculpture workshop as part of their "The Factory Floor" event associated with their major Winter 2014/15 exhibition of William Morris and Andy Warhol, entitled "Love is Enough". The workshop will include demonstrations, tools, materials, and a display of finished work, and will run from Wed-Sat 17-20th December 2014, from 2-5pm each day. The exhibition runs from 6th December 2014 until 8th March 2015. More details of "The Factory Floor" event can be found on the Modern Art Oxford website here. More details of the "Love is Enough" exhibition can be found here. Detailed schedule for all the workshops can be read here. Esther Lafferty (Director of Oxford Artweeks) has published an interesting article in the October issue of OX magazine, entitled "The art of industry". It features extensive biographical information and sculpture by Nigel Williams. Read the article page 1 and page 2. Read the online version of the article here. Download the entire magazine here (20Mb PDF) - the "FarmStrong" features on the Contents page. Nigel Williams has been invited to show at The Independent Artist Fair, near Brick Lane, London, in October, where there will be an opportunity to see the "Farmstrong". Full details here. Traction Magazine have published an interview with Nigel Williams by the editor, Susie Pentelow. See the "front page" of Traction Magazine here, or go straight to the full interview here. Got the waders out again to open a new exhibition of outdoor sculpture (or indoor, if you fancy it!) at Romsey World of Water, near Southampton. Five sculptures in an aquatic environment - all in, on, around (even under?) water. See the exhibition page for more details. ... of fertiliser! The latest invention by Nigel Williams (or was it W.G. Armstrong?) is designed for the most efficient method of fertiliser distribution - from the air! Possibly the first ever agricultural use of ballistics, more information and pictures of this extraordinary device can be found here. April 29th 2014 - Radio exposure! Nigel Williams is interviewed by Mike Read on BBC Radio Berkshire at 3pm on April 29th 2014 to talk about his work. The Newbury Weekly News features an article in its April 24th edition about Flickendorfer's Celebrated Tea Refinery and its display in Covent Garden. Read the article here. 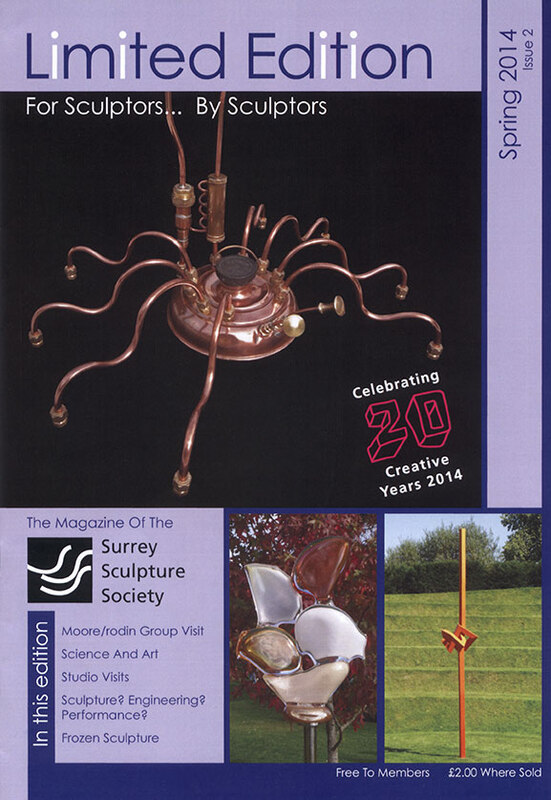 The Surrey Sculpture Society magazine "Limited Edition" features a picture of the Arachno-copta Improved Bed Warmer on the cover of the Spring 2014 edition (see here). Across the centre-fold of the magazine (careful, missus!) is a four-page article by Nigel Williams entitled "The Science & Art of Domestic Bliss", featuring in addition Flickendorfer's Celebrated Tea Refinery, Fatal Mistake, Munitio sanduskia, Superhero's blowtorch, The Massive Moth Immobiliser, Vimworthy's Patented Swarm Eliminator and Monitor Medusa. You can read the entire article (2.8Mb PDF) here. Did you ever think that Vimworthy's Patented Swarm Eliminator might not be ideal for dealing with single large irritating bugs?. The solution is now available: "The Concentrator"! For more details see here. Flickendorfer's Celebrated Tea Refinery will be displayed in the rarified atmosphere of the Whittard of Chelsea store in Covent Garden, London, from 7th March 2014. For more details, see the exhibition page. Scheduling for spring and summer exhibitions for Nigel Williams in 2014 is proceeding apace. Those booked so far include Showborough House, Henley Arts Trail, Ardington, Oxford Artweeks, Hillier Gardens and Wyndcliffe Court. For full details, see here. January 30th 2014 - Whisky? Or Tea? Or Both? Find out how to combine your two favourite drinks with the latest domestic invention by Nigel Williams here! Troubled by giant moths? Or just large numbers of small ones? The latest sculpture by Nigel Williams may provide a solution. See it here! You might be concerned (and even miserable) about the prospect of approaching winter, with its cold nights and empty beds. Fear not, Nigel Williams has discovered a unique invention designed to end all worries associated with climbing in between cold unforgiving sheets. Behold the "Arachno-copta" here! "Flickendorfer's Celebrated Tea Refinery" will be displayed at the Oxford Art Society exhibition at The Oxfordshire Museum in Woodstock, Oxfordshire, from 21st September to 13th October 2103. 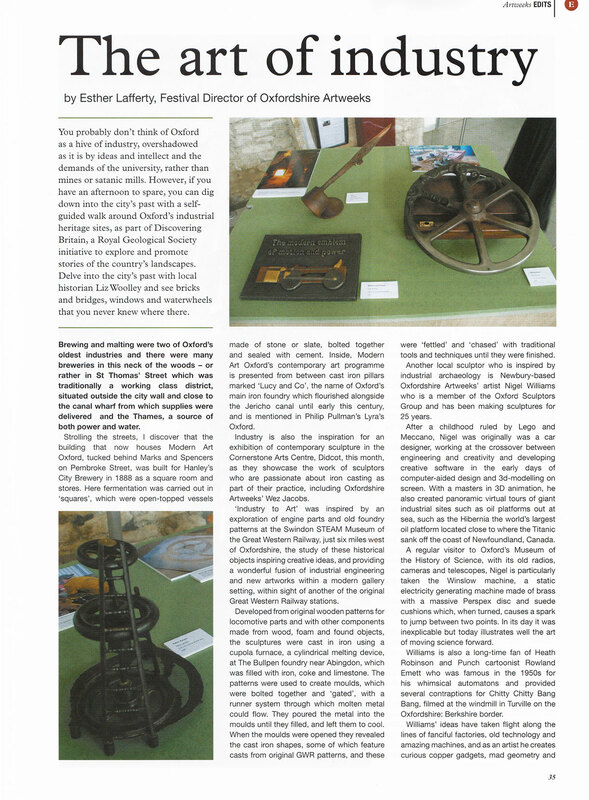 The Rowland Emett Society have published another article about Nigel Williams, this time in their August Newsletter, about "Flickendorfer's Celebrated Tea Refinery". See it on page 7. Are you a tea-lover? If so, you may be excited by the latest 'product' from Nigel Williams: a sculpture entitled "Flickendorfer's Celebrated Tea Refinery". Find out how to improve your tea-drinking experiences here. This piece will be displayed at the Asylum V Steampunk Art Exhibition. 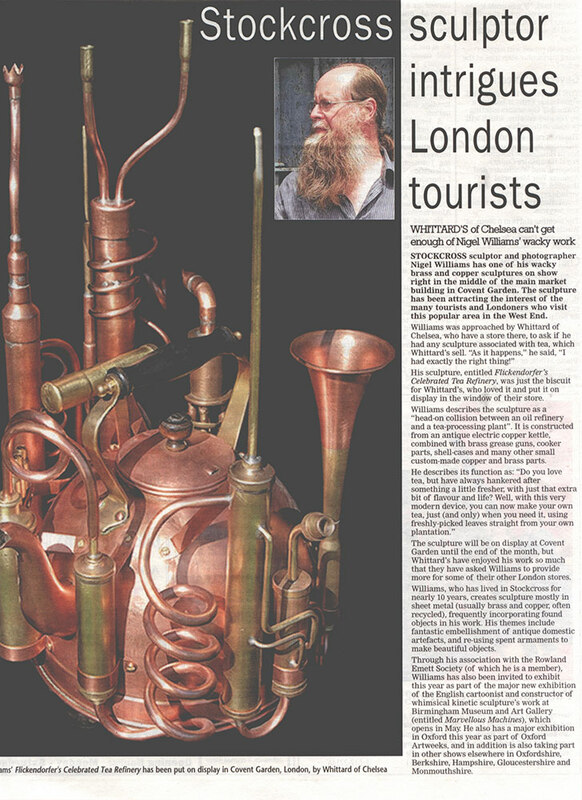 Nigel Williams has been invited to display two pieces of work at the Art Exhibition associated with the Asylum V Steampunk Festival at The Collection Museum in Lincoln, UK, during August & September 2013. More information here. "Vimworthy's Patented Swarm Eliminator" (which will be shown there) is featured on the venue website. The National Trust publicity poster for the 2013 Sculpture Exhibition at Hidcote Manor in Gloucestershire features "Teluma calamus" by Nigel Williams. See the poster here, and more information about the exhibition (Sep 2013) here. 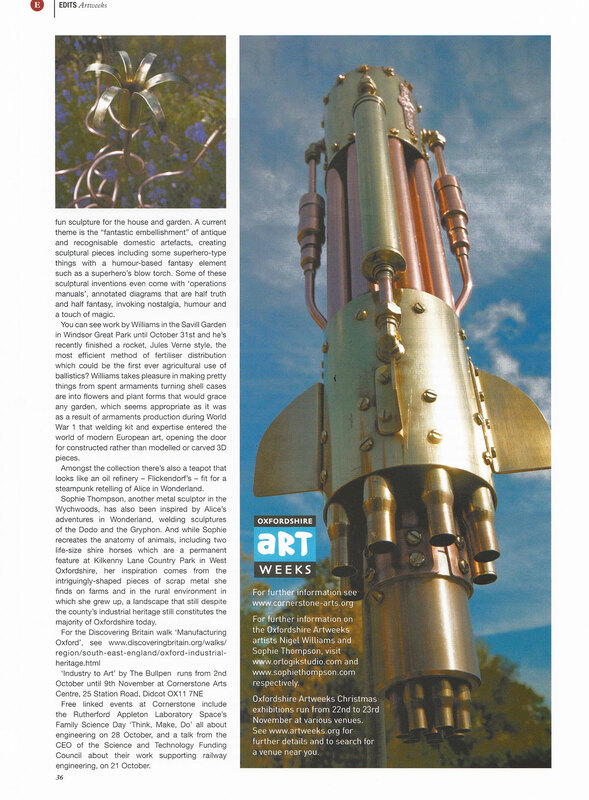 Nigel Williams has been invited by the Rowland Emett Society to write about his sculpture for the Society Newsletter, leading up to exhibiting at their convention in Leeds in October 2013. The resulting article has been published in the June edition of the Newsletter, which can be read or downloaded here. ... from a gear wheel! A simple botanical form with regular involvement from spent munitions. See it here, and at the "Sylvansmiths" exhibition. Well... only if you're a member of a swarm! Get the lowdown on why swarms are quaking across the land here. Nigel Williams and Ed Elliott have recently completed a joint work, created especially for their "Sylvansmiths" exhibition at the Turrill Sculpture Garden in Oxford. Both artists have enjoyed working on the piece - so there will be more! More details on the work here. More details on the exhibition here. Sculpture by Nigel Williams is again featured in the "Sculpture Trail" exhibition for 2013 at the National Trust Hidcote Manor Gardens in Gloucestershire, UK, from 7th to 29th September 2013, where sculptures from the "Teluma" series will be shown. Nestled in the North Cotswolds, with sweeping views across the Vale of Evesham, the gardens were created by Lawrence Johnston, the famous British soldier and garden designer. Full details can be found on the National Trust website here. May 2nd 2013 - "Teluma calamus" sculpture becomes a family! A variation on the "Teluma calamus" sculpture by Nigel Williams has been completed, entitled "Teluma congeminus". This has turned the concept into a family - and another member is expected soon: "Teluma tenubis". For pictures and full details, see here. More botanical creation from spent munitions, Nigel Williams has completed a piece entitled "Tormento pentaphylla", utilising (as the title indicates) 5 of everything, including large 40mm shell-cases. For pictures and full details, see here. Nigel Williams will be exhibiting at the "Manifestation" Art Exhibition at Steampunk Doncaster, to be held on the 15th & 16th June 2013. This will be the first showing of the "Monitor Medusa" piece. More information is available on the Steampunk Doncaster website. March 30th 2013 - Completion of new sculpture "Monitor Medusa"
Nigel Williams has completed another "embellishment"-style sculpture, entitled "Monitor Medusa". This piece again employs fantasy and humour in large doses, together with a substantial quantity of pipe, mostly for the benefit of the steampunk decorator! For pictures and full details, see here. Initially a solo exhibition, Nigel Williams has decided to share with his friend and colleague, the very talented Ed Elliott, resulting in the "Sylvansmiths" concept (Ed works mostly in wood). The exhibition will take place at the Turrill Sculpture Garden in Oxford, UK, from the 1st June to the 27th July 2013. More information is available on the Turrill Sculpture Garden website. Work on display will include "Munitio sanduskia", "Armamentia latifolia", "Arbusculus diabolus cuprum", "Mixtec Maxtec", and a re-incarnation of "Ferric Messenger" (watch this space!). Nigel Williams has completed another work in the "botanical/armaments" series, entitled "Munitio sanduskia". It is over a metre high, incorporates 90ft (27m) of re-cycled copper pipe, and its name incorporates a reference to a city in the US which is the venue for an amusement park boasting the largest number of roller-coasters in the world. For pictures and full details, see here. Nigel Williams will be taking part in the Oxford Sculptors Group exhibition at the North Wall Arts Centre in Oxford, UK, from the 8th January to the 1st February 2013. More information is available on the North Wall Arts Centre website. A new "mask-style" sculpture, recently completed by Nigel Williams, is entitled "Mixtec Maxtec", because it is constructed from modern materials, but displays cultural influences ranging from the ancient Mixtec peoples of Mexico, right through to pop-art pictures of John Lennon's glasses. For pictures and full details, see here. October 18th 2012 - Books for iPad! Nigel Williams has published his "K-scopes" and "Pacific Northwest Iron" books as eBooks for the Apple iPad. And they're cheap! For more information, click on the respective book links above. As a member (and the webmaster) of the Oxford Sculptors Group, Nigel Williams will be taking part in the group exhibition at the Turrill Sculpture Garden in Oxford, UK, from the 6th October to the 17th November 2012. More information is available on the Turrill Garden website. Four pieces from the "Developed Frame" series of steel-framed image constructions by Nigel Williams will be on display at the 10th Anniversary "Art in the Ark" Exhibition at the Ark Centre in Basingstoke, Hampshire, UK, from the 15th October to the 29th November 2012. More information is available on the Art in the Ark website. Dan Fullerton, the writer of the foreword for Nigel Williams' "K-scopes" book, and previously Director of Innovation at Olds College, Alberta, Canada, sadly passed away suddenly on September 2nd, 2012. Dan was was a wonderful passionate, worldly-wise, highly-intelligent and inspiring man, and a very dear friend. He will be sorely missed. Nigel Williams has just completed an amusing new piece of sculpture, entitled "Superhero's blowtorch". This piece employs fantasy and humour (not to mention a large quantity of brass) to bring a smile to the face of anybody who enjoys comics, movies or steampunk. For full details, see here. August 7th 2012 - new image gallery: "Pre-dereliction"
We have created a gallery of 66 new images by Nigel Williams, entitled "Pre-dereliction", from a recent photo-shoot at a secret railway storage facility in Central England. The gallery can be seen here. Prints can be ordered of any images from this gallery - for more information on prices and ordering, click here. Frames can be commissioned with a "developed surface" similar to that in the print - please have a look at the "Developed Frame" series on our Sculpture page. Our suppliers have reduced their prices for a limited period, and we're passing that reduction on. Prints of size 40" x 30", for which we normally charge £40, will be available for £34 until August 31st 2012. Postage is free within most of the UK. For more information on Prints, click here. The "Ferric Messenger" sculpture by Nigel Williams currently features on the home page of the Surrey Sculpture Society website, as a result of it being on display as part of the Society's Summer Sculpture Exhibition at Beaulieu. For more information on the exhibition, click here. See also the Society's Exhibition Calendar page. To see Beaulieu's map and catalogue of the sculptures on display at the exhibition, click here. "Ferric Messenger" is number 31 on the map, situated within the ruin of the Chapter House, by the cloisters. The BBC aired a documentary yesterday about the National Trust Hidcote Manor Gardens (where Nigel Williams is exhibiting in September 2012), which showed the massive influence the development of this garden has had on gardens & gardeners worldwide. The National Trust Summer 2012 Magazine also describes the importance of Hidcote to the National Trust in the article about the National Gardens Scheme by Mike Calnan (NT Head of Parks & Gardens). So, a great priviledge to be exhibiting sculpture in this world-renowned site! If you're quick, you can catch the documentary on the BBC iPlayer. For more information on Hidcote, see the National Trust website. To see some of the sculpture on show there, click here. Sculpture by Nigel Williams is featured in the sculpture exhibition at the Savill Garden - an internationally renowned 35 acre garden which is part of the Royal Landscape within Windsor Great Park - from 1st August to 30th September 2012, where the newly-completed "Teluma calamus" piece will be shown. Nigel Williams' work is one of only 30 pieces selected for the exhibition from a huge range of submissions. The Savill Garden is one of Britain’s greatest ornamental gardens, created in the 1930s by Sir Eric Savill, under the patronage of Kings and Queens. Full details can be found on the Savill Garden website here. Nigel Williams has completed another sculptural work, entitled "Teluma calamus", which futher develops the theme of creating beauty from discarded armaments. For full details, see here. Sculpture by Nigel Williams is featured in the "2012 Sculpture Trail" exhibition at the National Trust Hidcote Manor Gardens in Gloucestershire, UK, from 8th to 30th September 2012, where the newly-completed "Armamentia latifolia" piece will be shown. Nestled in the North Cotswolds, with sweeping views across the Vale of Evesham, the gardens were created by Lawrence Johnston, the famous British soldier and garden designer. Full details can be found on the National Trust website here. Nigel Williams has just completed a major new piece of sculpture, entitled "Armamentia latifolia". This piece explores the emotional conflict involved in the engineering of war. For full details, see here. Sculpture by Nigel Williams is featured in the "Sculpture at Kingham Lodge" exhibition at Kingham Lodge in Oxfordshire, UK, from 5th May to 13th May 2012. Five acres of beautifully-landscaped gardens host work by more than 30 artists, including Johannes von Stumm - currently President of the Royal British Society of Sculptors. Full details can be found on the Kingham Lodge website here. This exhibition forms a part of the major "Oxfordshire Art Weeks" art festival, full details of which can be found here. Nigel Williams' sculpture "Ferric Messenger", which was recently seen by 15,000 people as part of the 'Angel Garden' exhibition at National Trust Mottisfont, is to be featured as part of the Surrey Sculpture Society Summer Sculpture Exhibition at Beaulieu in Hampshire, UK (National Motor Museum). Works by approximately eighty artists will be on show, and visitors will receive an illustrated map to guide them. The exhibition opens on the 24th May 2012, and runs until the 2nd September 2012. Opening times and other information about Beaulieu can be found on their website here. The exhibition 'A Matter of Time', featuring new work by Nigel Williams, opens at Arlington Arts Centre near Newbury on Monday 20th February 2012, and runs until Friday 13th April 2012. To see their brochure article, click here. Nigel Williams has constructed 5 large steel wall-hung pieces especially for the exhibition, which also features work by Normandy Soto and Flora Gare. The 'Private View' event is from 6-8pm on Friday 24th February 2012. Everybody is welcome! Please see your invitation to the event: front and back. The exhibition also features Nigel Williams' sculpture "Ferric Messenger", which was recently seen by 15,000 people as part of the 'Angel Garden' exhibition at National Trust Mottisfont. For further information, please see the Arlington Arts Centre website. The 'Angel Garden' exhibition at the National Trust site at Mottisfont Abbey in Hampshire, featuring the "Ferric Messenger" sculpture by Nigel Williams, has been extended by popular demand for another month, and will now run until the end of 29th January 2012. More information about, and pictures of, "Ferric Messenger", together with newspaper and magazine articles about the exhibition, can be found here. For more details about opening hours, location, etc of the 'Angel Garden' event at Mottisfont, click here. 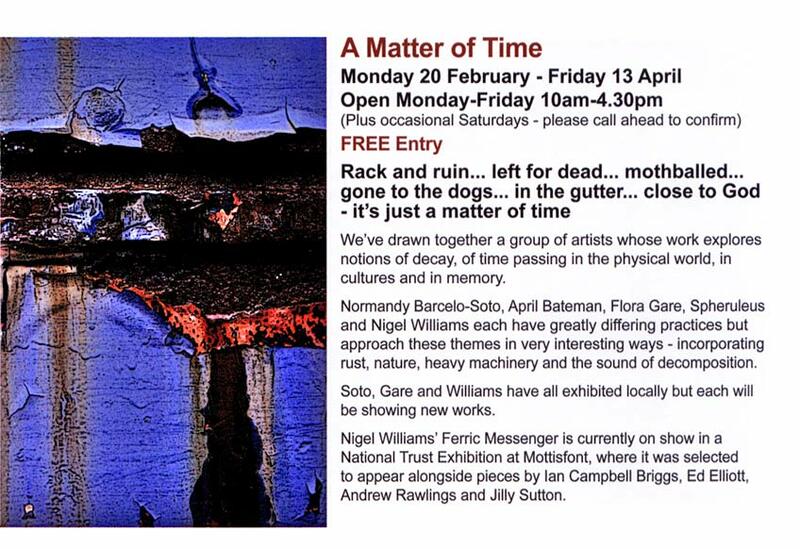 The Arlington Arts winter/spring 2012 season brochure has been published, featuring details of the group exhibition "A Matter of Time", inspired by, and featuring, work by Nigel Williams. The exhibition will open on 20th February, and run until 13th April 2012. To see the brochure article, click here. For more information, see the Arlington Arts website. The "K-scopes" image "Babel Overlook - in metal" has been selected for inclusion in the "Computer Art Image of the Month" feature by the Computer Arts Society Specialist Group of the British Computer Society for December 2011. Read the full article here. The image can be seen in the K-scopes blog, where it was originally published, here. We now have more details regarding the National Trust exhibition at Mottisfont Abbey in Hampshire. The exhibition is called "Angel Garden", and will open at 10am on the 2nd December 2011, when a celebratory tour of the sculptures will take place. The exhibition will be open until 5pm on the 2nd January 2012 (but closed over Christmas). The sculpture by Nigel Williams is entitled "Ferric Messenger" - information and picture(s) can be found here. Orlogik Books wil be attending the New Greenham Art Fair on Sunday December 4th 2011, from 10am-4pm. We will be selling books, framed prints, greetings cards, and sculptures. The event is at New Greenham Arts, situated in Greenham Business Park, Newbury, Berkshire RG19 6HN, UK. For full details please see the New Greenham Arts website. For directions to get there, see here. Nigel Williams has completed construction of the 'Angel' sculpture for the National Trust at Mottisfont Abbey. First picture and more information about finishing can be found here. For more details about the 'Angel Garden' event at Mottisfont, click here. October 5th 2011 - 25% off all new book orders! A discount of 25% on all orders of more than £20 for copies of "K-scopes", "Pacific Northwest Iron" and "Pacific Northwest Iron (Mini Edition)" is available until 31st October 2011. Just enter the promo code GLOBAL1 during the ordering process to get your discount. For details of "K-scopes", see here. For details of "Pacific Northwest Iron", see here. For details of "Pacific Northwest Iron (Mini Edition)", see here. Nigel Williams has been commissioned to construct a sculpture for the 'Mottisfont Angels' exhibition at the beautiful National Trust Mottisfont Abbey site near Romsey in Hampshire, England. The exhibition will be held between December 2nd, 2011 and January 2nd, 2012. For more information about the National Trust Mottisfont site, click here. Base is going to be less well-manned than usual due to a planned photographic trip taking place between 15th September 2011 and 3rd October 2011, so apologies if it takes longer than usual to respond to orders or enquiries relating to prints or sculpture during this period. Book orders will continue to be processed as normal. September 7th 2011 - 25% off all new book orders! A discount of 25% on all orders in GB£ for copies of "K-scopes", "Pacific Northwest Iron" and "Pacific Northwest Iron (Mini Edition)" is available until 19th September 2011. Just enter the promo code SEPTOFFER during the ordering process to get your discount. September 6th 2011 - New edition of "Pacific Northwest Iron"
Nigel Williams' book 'Pacific Northwest Iron' - a unique combination of detailed creative photography, industrial/transport/military archaeology, and travelogue - is now available in a new "Mini" edition. The new edition has almost as much content as the large format book (100 images instead of 119), but is in a more compact portrait format - and costs less than a quarter of the price! For full details and a complete preview, see here. Nigel Williams has been accepted into the Oxford Sculptors Group (affiliated to the 300-strong Surrey Sculpture Society), and expects to take part in exhibitions held by the Group, starting in 2012. For further information on the Oxford Sculptors Group, see here. For more details concerning the Surrey Sculpture Society, see here. For full details of sculpture by Nigel Williams, see here. An exciting new sculpture by Nigel Williams has been added to the sculpture gallery. For full details, see here. The wide-ranging and ever-surprising talents of Nigel Williams have enabled us to create a new gallery of three-dimensional modern sculpture. For full details and the opportunity to purchase a sculpture before they all disappear, see here. For more details of our range of canvas prints, please click here. Please contact us here to place an order. How coool would it be if your ultra-high-tech stainless steel and aluminosilicate glass iPhone looked like it was going rusty?? Orlogik Books have teamed up with Zazzle.com of Redwood City, California, and Society6.com, of Redondo Beach, California, to create a range of skins and cases for Apple iPhones, which add a "developed surface" to the back of the phone, making it look like it is made from a completely different (and rather lower tech) material!!! To find out what we mean, and how you can make your iPhone stand out from the crowd, click here to see our cases on Zazzle.com. To see our skins on Society6.com, click here. For Society6 iPhone cases, click here. For iPad and laptop skins, click here. And there are many more: follow the USA link, then click on 'See All' under 'Zazzle International' at the bottom of the page. Prints are now also available from ImageKind.com, of Raleigh, North Carolina, USA. The Orlogik gallery on ImageKind can be found by clicking on their button below. Prints of images not available via ImageKind.com can of course still be ordered directly from us from anywhere in the world. We have added another source for prints - RedBubble, this time especially suited to folks in Australia and New Zealand, since they are based in Melbourne. We also have some t-shirts on there! The Orlogik gallery on RedBubble can be found by clicking on their button below. Prints of images not available via RedBubble.com can of course still be ordered directly from us from anywhere in the world. Customers in North America can now purchase a range of prints of images from the "K-scopes" and "Pacific Northwest Iron" books, along with a few other select images by Nigel Williams, from "Artist Rising" (the "new artists" branch of Art.Com). Their website offers extensive facilities for choosing mounts, frames, etc, if required, together with very effective visualisation tools (i.e. what will it look like on the wall?). The Orlogik gallery on ArtistRising can be found by clicking on their button below. Customers outside North America can also use this facility to buy prints of course, but the prices are in US dollars, and the pictures are printed in and shipped from the USA. Obviously, we would prefer customers from the UK to order directly from us (it makes much more environmental sense, and of course we make more money that way!). Prints of images not available via ArtistRising.com can of course still be ordered directly from us from anywhere in the world. For more information about the Kindle edition of K-scopes, click here. To order the "K-scopes" book, please click here. For more details on this book, click here. To order the "Pacific Northwest Iron" book, please click here. For more details on this book, click here. To order K-scopes, please click here. To order Pacific Northwest Iron, please click here. We are pleased to announce that an image from Nigel Williams' book "K-scopes" has been accepted for the Open Submissions Exhibition to be held from the 21st October 2010 to the 25th November 2010 at the Corn Exchange and New Greenham Arts Gallery in Newbury, England. The image is 'Place de la Concorde' and will be displayed as a large framed print measuring 30" x 30" (much, much bigger than the version in the book!). The framed print will be for sale at the exhibition, but unframed prints of this image and all others from the K-scopes book and its associated blog are available for sale at that and other sizes from this website - for details, see here. For more details of the exhibition and venues, please see the Corn Exchange website. "Following on from his last release, K-scopes, Williams shows his creative flair by tackling quite an obscure subject - the colours and textures within old iron in America's Pacific Northwest region. You're probably thinking 'Huh?' But Williams captures rich colours and textures within the rust. Highly original." The Amateur Photographer website is here. "Williams’ obsession for not only detail, but discovering these sometimes hidden industrial subjects and creating photographs that transform these rusted, old, objects into abstract art, is what makes this a unique book." For full details of the review and the book, please click here. If you're a vintage vehicle enthusiast, and you've enjoyed some of the kaleidoscopic images from the K-scopes book, you may be interested in a unique new image that has just been posted on the K-scopes Blog Website. There are some very particular discounts offered on large prints of this image too - if you're in the know! To see the image and find out what all the fuss is about, please click here. The preview of 'K-scopes' by Nigel Williams has now been extended to display the entire book online. This means that if you want to cheat, you can, because you can look up all the secrets in the back of the book without buying it!! But wouldn't you rather keep hold of the fun by waiting until you get your copy to find out about each kaleidoscopic image and from what it was made? Some people think that if you can see everything on-line, you have no incentive to buy the book. As a book-buyer myself, I would much rather see the whole book, because that gives me a much better opportunity to make a fully-informed decision about buying. After all, in a bookstore, you can look at the entire book - and you can put it back on the shelf if you don't want to buy it. So, with this book, now you have a choice - you can look at the whole book if that's your preference, or you can save the secrets until you get your copy! Click here to see the newly-enlarged full preview. 'Pacific Northwest Iron', the latest book from Nigel Williams, also displays the entire book in preview. Click here to view. We are now able to offer prints on canvas, hand-mounted on Baltic pine stretchers, and in a range of sizes up to 24" x 20". They are good quality and excellent value. For full details, sizes and prices, please click here. July 6th 2010 - New book by Nigel Williams: "Pacific Northwest Iron"
Hot on the heels of his 'K-scopes' book, we are delighted to announce the publication of a brand new book by Nigel Williams, entitled 'Pacific Northwest Iron': a unique combination of detailed creative photography, industrial/transport/military archaeology, and travelogue! See here for full details. The book is offered with a 20% INTRODUCTORY DISCOUNT ON THE PRICE until the end of July 2010. To obtain this discount, please use the same promotional codes as those specified for K-scopes in the item below. 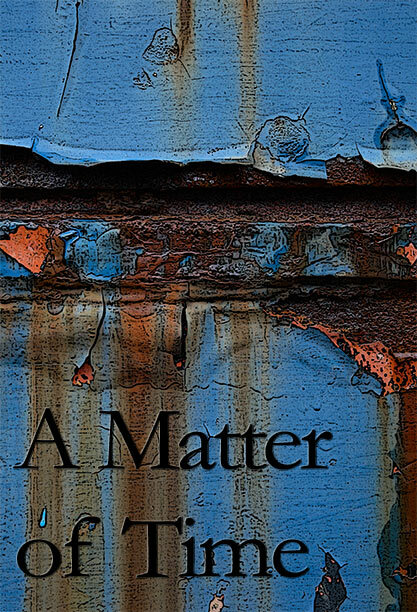 To go straight to ordering the new book, please click here. "Williams has created an intriguing series of images in which he's taken his subject, copied it, flipped and rotated it to create a picture in a style that might be created through the use of a kaleidoscope. This is one of the more unique books we've seen in a while, and some of the subject choices are quite clever. Best of all, in back Williams shows us thumbnails of the original pictures from which he took his subjects to give us a sense of wider context. This book is a clever lesson in always looking closer at the smaller details." To follow on from the release of the "K-scopes" book by Nigel Williams (see here), we have started a new way of distributing K-scope images. At regular intervals (or every time a new image is created), we will post an image to our new 'K-scopes Blog', where viewers will have an opportunity to comment on it. Every three months or so, we will publish a K-scopes 'magazine', which will contain a selection of the images accumulated in the Blog since the last magazine was published. This way you can build up a K-scopes Library, without spending too much money. You will also have the opportunity to influence, and contribute to, the content of each magazine - because if we put up an image and everybody says "I hate that" - we'll leave it out! But if you make some interesting observations or constructive comments, we could include those! If you want to be notified each time a new image is posted, you can subscribe to the blog by entering your email address under 'Subscribe to Journal' in the Blog menu panel (not forgetting to hit the 'Go' button!). To get the ball rolling, have a look at the K-scopes Blog website here. We have become an affiliate to The Book Depository. This is basically because they pay us commission if we send people to their site, who then buy books from them! But we wouldn't do this if we weren't happy to recommend them - they have a vast range, and we have had many years of great service, low prices, and free delivery from them. We've added a link to them on our new books page (buy our books *first* please! ), but if you'd like to go straight to them, click on the banner below. We have introduced a mailing list, for folks who are interested in what goes on at Orlogik Books. The mailing list will be used to send occasional newsletters to participants, providing information concerning new book, print or card releases, special offers on products or delivery, etc, etc. To take part, please enter your name and e-mail address into the panel at the bottom-left of any page on the web-site, and hit the 'GO' button. You can opt out of receiving the newsletter any time you like by entering your name and e-mail address into the same panel, but switching to the 'Unsubscribe' toggle before hitting the go button. We have introduced a convenient new on-page preview system for the "K-scopes" book. You can preview the book, and initiate the purchase process if you wish, all from this website. We have just published a brand new book of intriguing kaleidoscopic images by Nigel Williams, entitled 'K-scopes'. See here for full details. To PREVIEW or PURCHASE, click here.